But Santa's sleigh is on its way! Christmas Eve 1974 is marked indelibly into the Australian psyche, as the night tropical Cyclone Tracy devastated the city of Darwin. Now, over 40 years later, Jackie French's lyrical rhyming text tells the story of a city's indomitable spirit, and Bruce Whatley's sumptuous illustrations bring to life the powerful force of the storm to a whole new generation of readers. Cyclone truly is a stunning picture book. 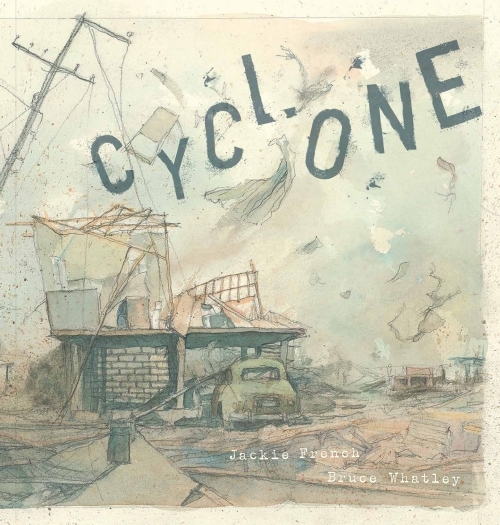 It’s amazing that something as devastating as a cyclone can be so beautifully and clearly depicted by both writer and illustrator. French’s lyrical language brings the reality of Cyclone Tracy’s effect on Darwin to life for children. We read of wind that snarls but is pretty much ignored as the kids dream of Santa’s arrival and Christmas day. Snarls turn to groans and growls, shrieks and howls, then when their house is destroyed and the small family tries to flee, they are “Slashed and bitten by debris” while the world around them is only storm. Whatley chose a toned-down palette to reflect the old photographs he used while researching Cyclone Tracy - graphite pencil and acrylic wash set the mood perfectly for both the cyclone and its aftermath. Cyclone is part of a series that began with Flood. It also works well as a completely stand alone picture book for kids to read and enjoy. Schools looking for resources for Australian History, Geography and Science will grab this great text. It makes a wonderful choice in English, when teachers are searching for examples of metaphor, and for anyone who wants to explore creativity with kids. Hard to believe this outstanding children's picture book didn't make the 2016 CBCA Notables list. It definitely gets the coveted Book Chook Feather of Approval!